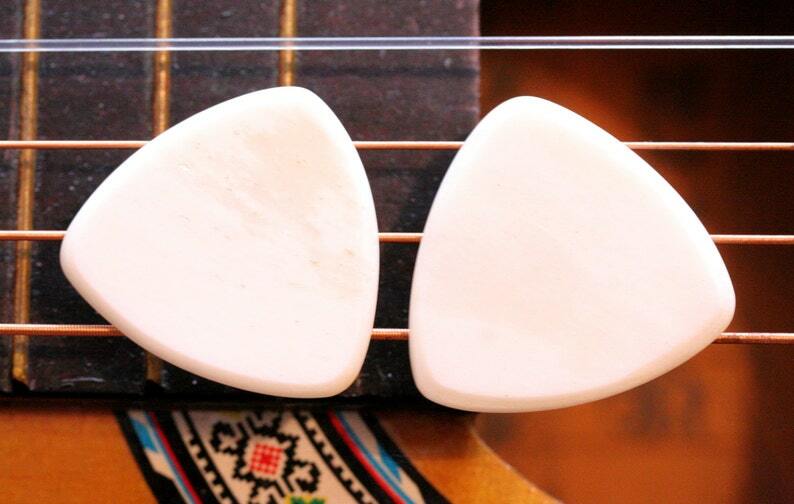 Handcrafted in Nashville by Master Artisan Guitar Picks - This style of guitar pick is crafted from authentic buffalo bone blanks in a 2mm traditional styled triangular shape with liquid smooth beveled edges. The sound is bright and earthy on the strings, has a silky smooth attack and provides a very dynamic range of tonal and volume capabilities. Because the picks are crafted from organic natural material, no two are exactly alike and have their own character. For centuries, stringed instruments have been struck with natural materials such as leather, bone, horn and wood, whether as a plectrum or hammer, to intensify the unique tonality and volume of the instrument itself. Master Artisan Guitar Picks build on this age-old technique with quality handcrafted picks from Nashville Tennessee. Most professional guitar & mandolin players have several handcrafted picks in their collection that they use for recording and live performance because of the unique tones each individual pick produces. 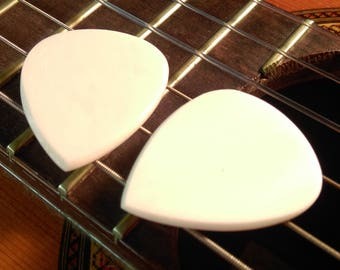 Like a painter of fine art uses a variety of different brushes, so an instrumentalist should have a variety of plectrums. This is my second order of these natural picks. They are the best feeling/playing picks ever. Some for me in the set and some for gifts! Thank you - I LOVE these beautiful picks! 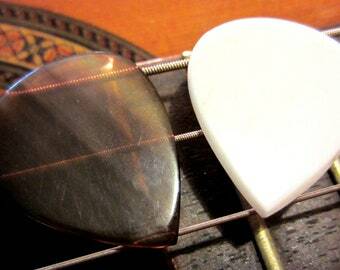 I love the feel of these beautiful natural picks and the sound from my mandolin is so nice. I am never using synthetic picks again - and I will definitely buy more from GuitarPickCollection. Right now my favorite is the coconut, but just because the bone and horn look too gorgeous to practice with until I can play better :) Thanks too for the bonus pick! Great service, perfect picks! Perfect!! After I realized I ordered the wrong picks the first time around, you guys got these to gift them to Me lightning speed! I can’t wait to gift them to my mandolin playing Valentine.